Now, with nature as their inspiration, Northwestern University scientists have developed soft materials that autonomously self-assemble into molecular superstructures and remarkably disassemble on demand, changing the properties of materials and opening the door for novel materials in applications ranging from sensors and robotics to new drug delivery systems and tools for tissue regeneration. The findings were published recently in the journal Science. Samuel Stupp, PhD, director of the Simpson Querrey Institute for BioNanotechnology and co-corresponding author of the paper that described the creation of new synthetic nanomaterials that self-assemble and disassemble on demand. 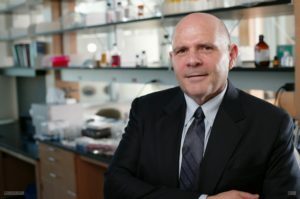 Stupp is the Board of Trustees Professor of Materials Science and Engineering, Chemistry, Medicine and Biomedical Engineering, and of Medicine in the Division of Endocrinology. Erik Luijten, PhD, Professor and Chair of Materials Science and Engineering and Engineering Sciences and Applied Mathematics, was the co-corresponding author. To create the material, Stupp and his postdoctoral fellow Ronit Freeman, PhD, now an associate professor at the University of North Carolina, Chapel Hill, developed some molecules composed of peptides (compounds of amino acids) and others composed of peptides and DNA. When placed together, these two types of molecules co-assembled to form water-soluble nanoscale filaments. Even better, the scientists found that when they added a simple DNA molecule that could disrupt the double helices interconnecting filaments in the superstructures, the bundles came undone, and the material returned to its simple initial structure and softer state. Another type of molecule could then be used to reform the stiffer materials containing superstructures. That sort of reversibility had never before been achieved. Stupp and his lab members then created the same material using only peptides instead of DNA. When the scientists used peptides with opposite charges in a specific architecture that mimics DNA complementarity, they found that they self-assembled into superstructures that also were reversible when the charges were neutralized. The potential uses for these materials expand into medicine and beyond. A complex therapy with proteins, antibodies, drugs, even genes could be stored in the superstructures and released into the body on demand as the hierarchical structures disappear. Scientists could also search for new materials in which the reversible superstructures lead to changes in electronic, optical or mechanical properties, or even color and light emission, Stupp said. The new materials also led the scientists to a biological discovery. They took astrocytes — cells in the brain and spinal cord associated with neurons — and placed them on the new materials. Astrocytes are important because when the brain or the spinal cord are injured or diseased, they acquire a specific shape known as the “reactive phenotype” and produce scars that are dense fibrous networks. In the healthy brain, astrocytes have a “naïve phenotype” and a different shape. Interestingly, when the scientists placed astrocytes on the material with only simple filaments, the astrocytes had a naïve phenotype, but when the superstructures formed they became reactive. They then reverted back to the naïve phenotype when the hierarchical structure disassembled. This discovery linked the architecture of the cell’s microenvironment to these critical changes of phenotype in injury and disease of the central nervous system. The experimental work was funded primarily by the U.S. Department of Energy and the computational work by the National Science Foundation and the National Institutes of Health. Biological experiments were funded by the Louis A. Simpson and Kimberly K. Querrey Center for Regenerative Nanomedicine at Northwestern’s Simpson Querrey Institute.